While we wait for the The Show servers to continue to stabilize, it’s at least comforting to know there are some game modes where you don’t have to worry about games freezing or being sent to the queue to potentially be lost forever. One of these modes is an updated offline franchise mode that, as usual, has not received quite the amount of attention from the developers as the more lucrative and increasingly popular Diamond Dynasty mode that is keeping all of those servers overworked. However, that doesn’t mean that franchises have been completely ignored this year. When it comes time to play what can be an intimidatingly long baseball season, The Show has given you a few ways to help you work your way through your team’s calendar. Naturally, you can just choose to play the full 9 innings for the entirety of your 162 games, but going that route will likely take you right up until the release of MLB The Show 18. 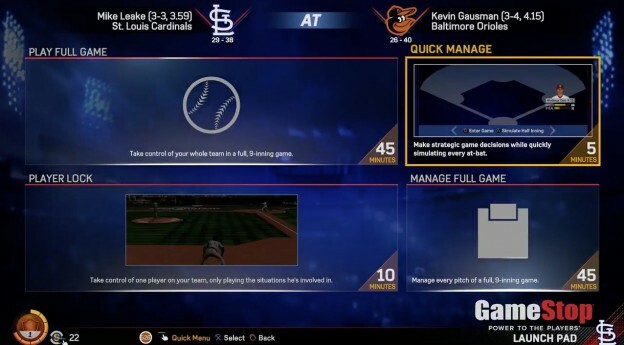 So it may seem a little funny to say that one of the biggest changes to franchise mode this year is a feature that will actually keep you from playing more of the game itself, but that’s the truth when it comes to the The Show’s new quick manage option. Quick managing of games is a neat way of allowing you to breeze through a lengthy schedule without surrendering too much control of how you would like your team to approach individual at-bats. With just the push of a button, you can cycle through batter after batter as you are informed of the result of the plate appearance, from groundouts to errors to home runs. Along the way, you can decide whether you want to bunt, bring in a pinch hitter or runner, flash the steal sign or even execute a hit and run. On the pitching side of things, you can change pitchers without the need for warming up relievers, pitch around dangerous hitters, and in what might be the most exciting option for those who truly like to micro-manage, attempt to pick off baserunners. This is a solid alternative to the fast forward option in previous versions of The Show that simply left too many decisions in the hands of the AI’s flawed judgment. Perhaps some people would prefer to go even further and handle their managing on a pitch-by-pitch basis, but that would hardly make for a very quick experience, would it? As it is, you can always choose to exit quick management and play the game in process at any time and then go back to quick managing it again whenever you like with no additional load time. For those who desire a quick experience but actually want to play the game, there’s the new critical situations mode that borrows Madden’s Play The Moments idea to allow users to only jump into games when they’re on the line. This includes the opportunity to shut the door with your closer or the chance to hit a dramatic walk-off home run and be the hero without having to worry about all those less exciting early innings. Or, if you’re especially interested in the fate of only one player on your team, there’s also a player lock option that allows you to re-create the Road to the Show experience and only step into the moments in a game that involve the player of your choice. While this isn’t exactly a new addition to the game this year, the option is featured a little more prominently than last year. Additionally, for those who don’t want to play the game but would like to see everything at least unfold in front of them, there’s also a manager mode to ensure that no matter what your preferred level of involvement is in any game, The Show would appear to have all of its bases covered. Aside from the new menu that lets you choose which of these many options you’d like to use to play your franchise game, there are also a number of small changes to how you manage your team throughout the season — assuming you even want to control anything beyond in-game decisions. There’s a new weekly cash flow budget to keep an eye on for anyone who likes to crunch numbers, a slightly revamped scouting system for those who like to find and draft prospects on their own, and the chance to finally import your franchise from last year so you don’t have to start all over again and lose any momentum you’ve created or those precious computer-generated players on your team to whom you’ve become especially attached. With all of that being said, there aren’t really the sorts of groundbreaking updates to franchise mode that warrant an incredible amount of fanfare, which is a little upsetting to those who have been devoutly committed to the mode and have been waiting years for certain features to become available to them. This means that anyone who had hopes of relocating franchises, creating stadiums or executing anything other than the most straightforward of trades is likely to be a little disappointed — they’re left with the usual hope that these are issues that might see more attention next year. There also does not seem to be many solutions to some of the problems that have plagued franchise users in the past, meaning that player progression can be a little troublesome (old players regress too quickly while young players don’t progress fast enough), and small bugs such as the Cy Young being awarded to middle relievers continue to persist. It may not be perfect, but franchise mode remains a reliable option for anyone looking to get a realistic taste of what it’s like trying to make all of the right moves both on and off the field to lead your favorite team to a World Series. It’s also the perfect rebuttal to anyone insisting the game is useless just because they’re unable to log on to the servers to play Diamond Dynasty, as there’s plenty of enjoyment to be had pitting your baseball skills against the challenging computer for season after season. MLB The Show 17 Twitch Stream Has Started, Come Join Us!